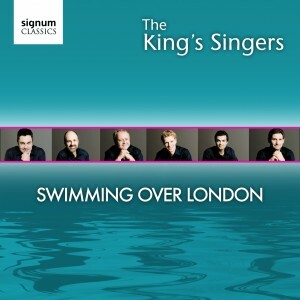 Swimming Over London is a recent studio album of jazz inspired hits and recent commissions performed by The King’s Singers, and is a follow up to their Grammy Award winning crossover album Simple Gifts. This album covers a huge range of pop and jazz inspired influences – from old favourites (Nat King Cole’s Straighten up and fly right, Arlen & Gershwin’s It’s a New World and Hoagy Carmichael’s Lazy Bones) to modern hits (Michael Bublé’s Home, Jason Mraz’s I’m Yours and Imogen Heap’s Hide and Seek). Commissions especially for the album come from Bob Chilcott, Mia Makaroff, Ysaye M. Barnwell and Roger Treece. A special King’s Singers arrangement of Mika’s By the time is also featured, inspired by their performance with him for the 2009 Mencap Little Noise sessions at the Union Chapel.